The Mitts and Merrill Company was founded in 1854 in Saginaw, Michigan. 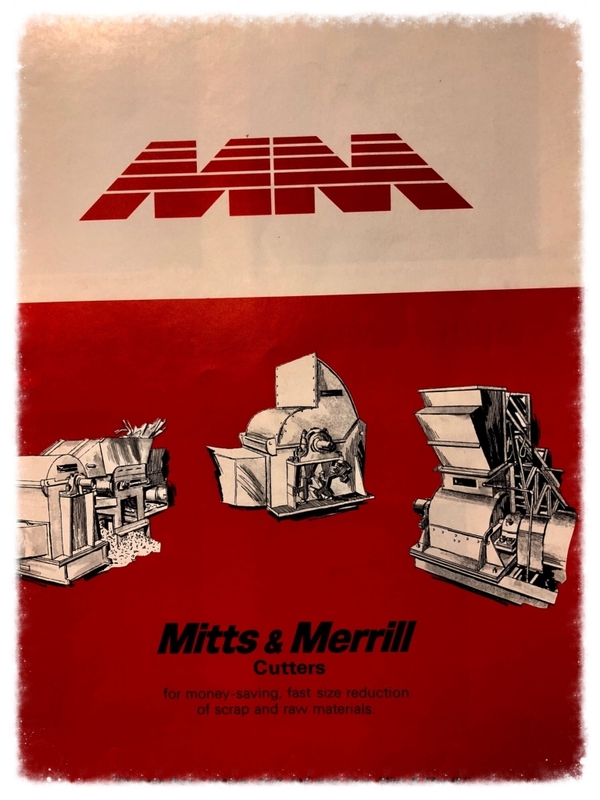 During the years that followed, Mitts and Merrill conducted extensive research in the area of size reduction and material handling and as a result of that research, developed and patented their extensive lines of equipment for the material handling and reduction industry. 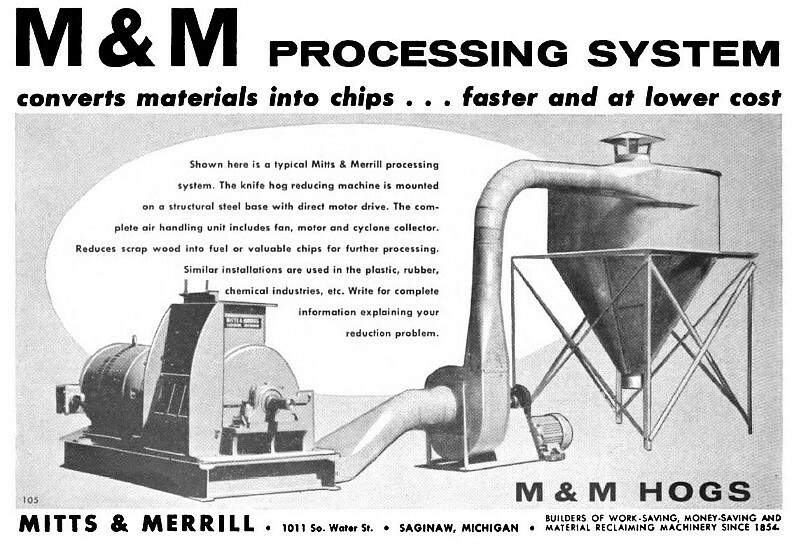 From meat rendering plants to polymer production facilities, there were very few industries or materials that Mitts and Merrill did not produce a shredder or grinder. Over the years, the product line was transferred to a few different corporate owners, and since May 2004 Jordan Reduction Solutions has been the sole owner and manufacturer of the Mitts and Merrill legacy of equipment. Click here to see the latest Mitts and Merrill Grinders manufactured by Jordan Reduction Solutions. One of the early units produced was simply called the “Series 1 Cutter”. 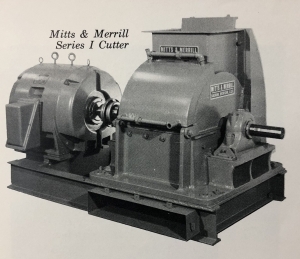 The Series 1 Cutter was a direct drive, solid rotor grinder with staggered 6″ knives and was manufactured even earlier under three distinct models. The Series 20 – 20″ rotor; the Series 26 – 26″ rotor and the Series 30 – 30″ rotor. 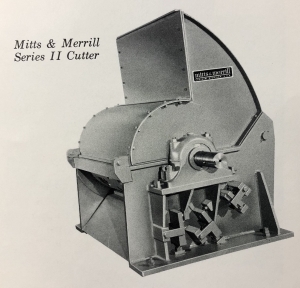 The original Series 26 and Series Model 30 were heavily used by the rendering and industries for animal and meat processing with the Series 30, Model 2436 being able to handle an entire hog carcass at a rate of 30 tons per hour. Later these series units would be updated and expanded to other material processes. What was once the Series 26 is now marketed as the 13 Series in multiple widths and the Series 30 became the 14 Series. Just for reference as you look though our website, the above referenced Series 30, Model 2436 is now known simply as the 14CSH. These robust units continue the legacy of service in multiple industries around the world. The Series 2 Cutter began to be primarily marketed as a “rubbish hog” and later became popular in the wood processing industry. The unit was very forgiving with regard to tramp metals as the rear of the unit had break away struts that would immediately relieve stress of metal contaminants and exit them from the chamber. Today this unit is manufactured under the “15” series.